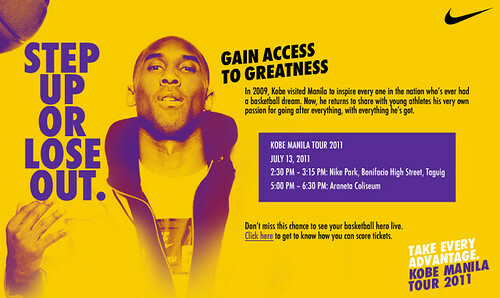 Nike Philippines for the third time, will bring the living legend Kobe Bryant on July 13, 2011. He will give a quick basketball clinic to kids and teens. Manila is Kobe’s first stop. He will then go to South Korea and China. Tickets are FREE, and can be gained at the following outlets: Nike Park The Fort and Titan The Fort on July 2, 2011 only. Only two tickets per person. Listening to Magic 89.9 and Wave 89.1, and “liking” the page at Facebook.com/Nikebasketball.phils will also give you a chance to get free tickets. Oh, the joys of being in Metro Manila. i have 2 tickets 4 d tour..im selling it 4 400 each..text me if ur interested..09166299404..